I do not use cleansing wipes daily, and I know they don't have the brightest reputation in the beauty world, but I enjoy having a pack of them around. They can be of great help in certain situations: when I'm sleeping over at a friend's place, for example, and don't want to carry a bottle of make-up remover and cotton pads in my bag. Then, there are the days where I'm too lazy/tired to go through my entire routine and would gladly shorten it by a few minutes. I also work as a movie extra from time to time, where I get my hair and make-up heavily done. When the shoot is over, the first thing I do is run to the closest bathroom and wipe away the layers of foundation and powder that have been applied and reapplied throughout the day. Last time, I had bright blue eyeshadow and bold eyeliner on, and I was glad to have something to clean my face before taking the subway home! In short, I think that make-up removing wipes can be handy for occasional use, and I like to test out a different brand every time I repurchase a pack. 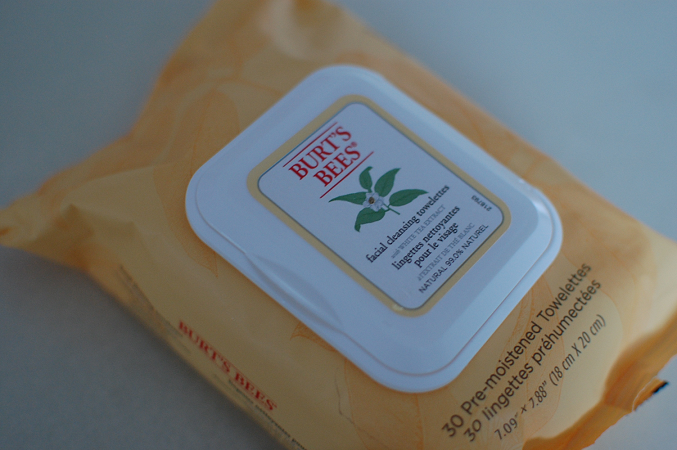 My latest choice were the Facial Cleansing Towelettes with White Tea Extract from Burt's Bees (around C$10 in drugstores for 30 towelettes). What did I think? For one, the packaging is very nice. I love when make-up wipes come with a plastic cap instead of a flimsy sticker. When a product is a staple for on-the-go skincare, its packaging should stay put while being tossed around in a woman's handbag, and this one definitely does. It also deserves extra points for being cruelty-free. But that's about it. Don't get me wrong, these wipes are not awful; but their 3/5 overall rating on MakeupAlley is well-deserved. While they don't irritate my skin and, with some effort, manage to remove my make-up, I will not be repurchasing. The make-up I wear day-to-day is very light and easy (no foundation, no eyeliner, no waterproof products), so it should not be a hassle to take off, and I'd rather not be pulling on my lids so much just to remove mascara. In this case, it would be quicker to soak a cotton pad in make-up remover, which defeats the purpose of the product. These towelettes are a touch too dry for my taste, and a more saturated version would probably be more effective. I also have to mention the smell: a strong, sweet fragrance that brings a glass of lemonade to mind. And, while I love the drink, the scent of this product is more overpowering than refreshing. 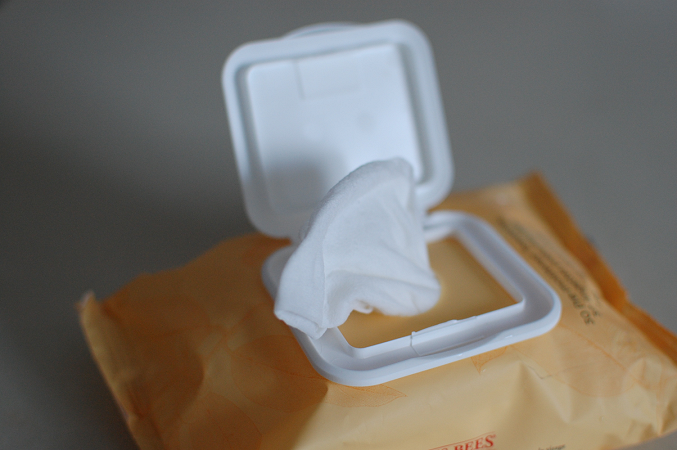 What are your favorite make-up removing wipes? Haha, I'll be sure to avoid those Garnier towelettes then :) And thanks for the recommendation! I did not see (or notice) this product here in Canada, but I'll keep them in mind if I ever do!